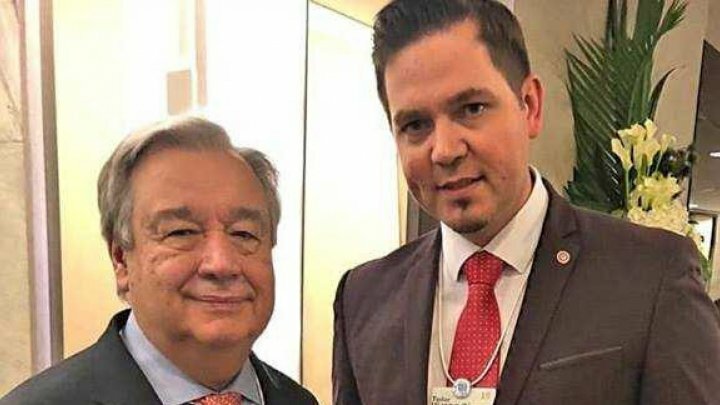 Minister Tudor Ulianovschi had an exchange of views with United Nations Secretary-General Antonio Guterres in the margins of the Davos World Economic Forum. During the talks, the head of the Moldovan diplomacy affirmed the importance of respecting the principles of international law and the UN Charter, which underpinned the adoption of the Resolution on the complete and unconditional withdrawal of foreign military troops from the territory of the Republic of Moldova. Moreover, the elites also discussed our country's intention to have a more active presence of Moldovan soldiers in peacekeeping operations under UN auspices. Reiterating the importance the UN attaches to the process of transforming and modernizing our country for the benefit of the citizens, the UN Secretary-General highly applauded the diploma Diplomatic Merit awarded by the Ministry of Foreign Affairs and European Integration to Dafina Gercheva, UN Resident Coordinator in the Republic of Moldova, as a sign of gratitude for her dedication, leadership and devotion. The UN Secretary-General welcomed the Moldovan Government's decision to open new missions to expand our country's diplomatic presence in Africa, Latin America and Asia, underlining that it will help strengthen both bilateral relations with the world's states and the multilateral dialogue on the international arena.